Read a brief synopsis and Silent Running looks interesting, it imagines the dreadful prospect of a dystopian world that’s bereft of wildlife and personality. It’s well intentioned and quite prescient; it chimes with contemporary environmental issues. This should all be interesting, but it’s very dull indeed. Silent Running takes place aboard a spaceship which has several domes containing an array of plants and wildlife. These are maintained by Freeman Lowell (Bruce Dern), a man whose strong views on ecology make him a pariah among the other crewmen. When Lowell’s forestry is arranged to be destroyed by the powers that be, he reacts in a way that is, to understate, morally dubious. One of the main reasons why this is all such a drag is because we’re given no depth, it isn’t explained why Earth is a barren dystopia or why they’re going to Saturn. You expect the crew members to imbue the film with substance however the character development is cut fatally short when Lowell blows them up early in the film. This plot development doesn’t do many favours for the sole remaining character either, because as much as Lowell’s indifferent and stupid colleagues annoyed me, did they really deserve to die? The film seems to justify their hurried dispatching, we’re supposed to care for this drab murderer and his forest. One-man shows like Cast Away require a good leading man in an extraordinary situation. The last one I saw was All Is Lost with Robert Redford. It was the most extreme example of the genre I’d seen and was grossly overrated on the ‘tomato-meter’ at 94%, but the ambitious film just about worked for me. 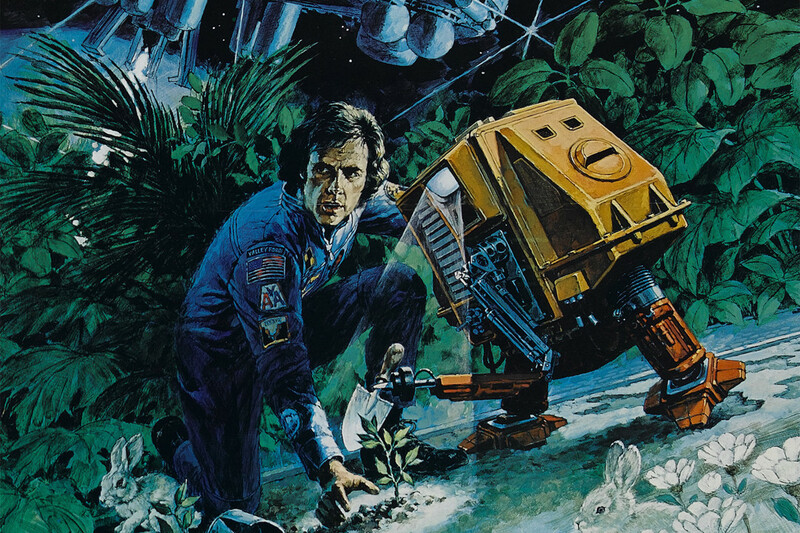 Silent Running gets neither an interesting lead character nor a compelling situation. Outside of an impassioned diatribe against his colleagues’ indifference about the environment and the human condition, Lowell is a long faced, shaggy haired non-entity. Once he is the sole remaining homo-sapien, Lowell’s only companions are three charisma bereft robots called Huey, Dewey and Louie (this is cute apparently), whose organs of communication are metal flaps that emit a quiet, meaningless sort of whistle. The supposed spectacle of Silent Running is also underwhelming. Director Douglas Trumbull worked on the special effects in 2001: A Space Odyssey, they’re very much of their time in parts but nonetheless sensory and epic in scope. However, in Silent Running, Trumbull’s directorial debut, the exterior shots of the spacecraft often look decidedly fake and miniature and the explosions are lamentably dated and intangible. I watched this film on Mark Kermode’s recommendation. He loves this film, he considers it superior to 2001 and shockingly names it one of the greatest films ever made. He says that it’s a human tale, that Dern’s relationship with the robots is deeply affecting, I couldn’t disagree more. The reason why Kermode likes it so much is because it’s nostalgic for him, he saw at just 11-years-old and subsequently grew up loving the film – I’ve had similar attachment to films like Jaws, which is of course infinitely better. After a while I was willing for the film to end, I became entirely indifferent towards the narrative’s dreary developments and the politics beneath them. I love nature and beautiful landscapes, I empathised with Lowell to a certain degree, however his actions make the film’s message all rather muddled. Silent Running may appeal to Green extremists, however I think even they’ll grow tired once they realise how little there is beyond its eco-friendly sentiment.